Investigators say the woman who claimed she was the victim of a violent racially-motivated attack fabricated the claims and actually set herself on fire. Paige Brown reports. The Louisiana woman who told police that she was set on fire by three men and that her car had racial slurs smeared on it did the heinous actions she described herself, authorities now believe. Sharmeka Moffitt, 20, told police she parked her car by a walking trail in Civitan Park in Winnsboro, La., on Sunday evening to go exercise when she was set on fire by three men who she described as wearing white hoodies. She was able to extinguish the flames herself and when police found her car, the letters "KKK" and the N-word had been scrawled across the hood. But what had the rumblings of a hate crime was all apparently a "self-inflicted situation," police said. Authorities released their findings at a press conference Tuesday evening. The Louisiana State Police, the Winnsboro Police Department, the Franklin Parish Sheriff’s Department and the FBI were all assisting in the investigation. Cain said police have not yet spoken with Moffitt, who underwent surgery Tuesday to treat burns covering more than 60 percent of her body on her chest, back, arms and legs. “We certainly hope to speak with her about it, but her health comes first,” Cain said. Moffitt remains in critical condition in the burn unit at Louisiana State University in Shreveport, the Shreveport Times reported. A few hours after police said Moffitt had lied, nearly 130 residents of the tight-knit Winnsboro community attended a candlelight vigil at Civitan Park Tuesday night to offer prayers and support to Moffitt and her family. 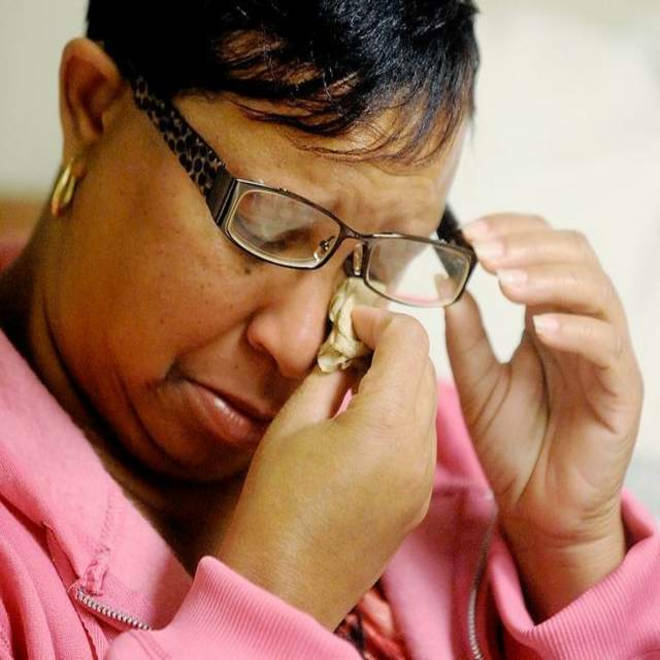 Edna Moffitt, the mother of burn victim Sharmeka Moffitt, wipes away tears during a press conference at LSU Health Sciences Center in Shreveport, La., on Tuesday. While Cain said he hasn’t seen anything of this nature in the area before, this isn’t the first time alleged hate crimes have been exposed as hoaxes. A Nebraska woman who claimed she was the victim of a homophobic hate crime in July was subsequently charged with making false claims to police after they spent three weeks investigating the case and discovered no clues or leads in the case. The woman, Charlie Rogers, 33, told police three men wearing black ski masks broke into her home during the early morning hours, bound her wrists and ankles with zip ties, beat her and carved anti-gay slurs into her arms and abdomen. Because of inconsistencies in Roger’s various accounts of the attack and conflicting forensic evidence, police arrested Rogers. A Washington state woman who falsely claimed a stranger had thrown a cup of acid in her face in August 2010 later admitted her injuries were self-inflicted and part of an attempt to kill herself. 28-year-old Bethany Storro was charged with three counts of felony theft for allegedly taking more than $28,000 in donations from people believing she had been assaulted by a stranger. When the acid proved not to be fatal, Storro told a detective that she could at least get plastic surgery on her face. Police have not yet said whether Moffitt will face criminal charges due to the attack.